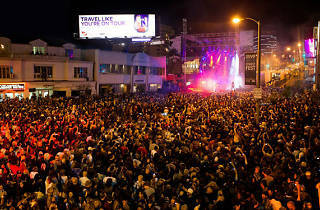 WeHo's see and be seen culture once again fills the street between Doheney Dr and San Vicente Blvd during the Sunset Strip Music Festival. This year's lineup noticeably pummels 2013's bizzarre cocktail of less-than-relevant acts (no offense, Linkin Park fans) with headliners including Jane's Addiction (whaddup Perry Farrel), Failure and Coldwar Kids on Saturday, followed by Empire of the Sun, Mayer Hawthorne and Iration on Sunday. Certainly an improvement, particularly considering the admission prices, which range from a $75 one-day ticket to a nearly $500 two-day "Ultimate VIP" pass. 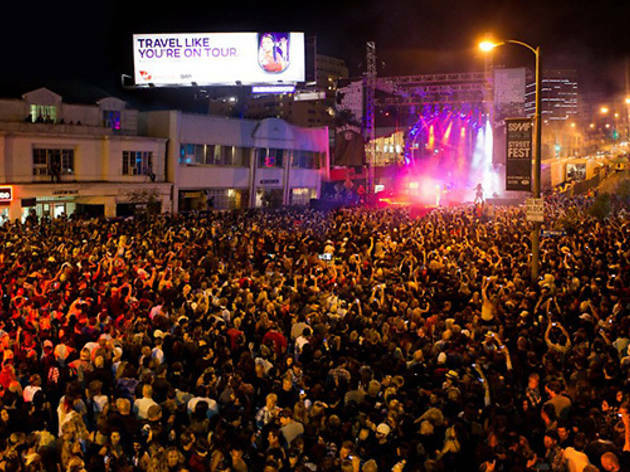 The festival ends at 11pm on Saturday and 10pm on Sunday, but venues along the strip—Whisky A Go-Go, The Roxy, Viper Room—will keep the live music going until 2am for ticketed attendees of the nocturnal persuasion. Passes are available for online purchase here.